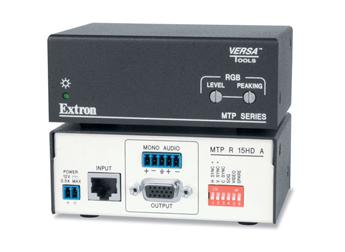 The Extron MTP 15HD A Series is a versatile family of mini twisted pair transmitters and receivers for transmitting high resolution computer-video and summed mono audio signals long distances to presentation displays over a single unshielded twisted pair cable. They are compatible with resolutions up to 1600 x 1200 and will support cable runs of 600 feet (185 meters) or more with XGA signals, and 450 feet (135 meters) or more with UXGA signals.The MTP 15HD A Series is ideal for systems where high resolution video signals must be transmitted long distances to a display where conduit space is limited or for systems where cabling might be exposed or visible. Ideal applications include public information displays at airports, museums, movie theaters, and hotels.